UV laser marking machine takes 355nm pumped UV laser device as the light source and takes advantage of previous generations machine to gain smaller diameter of focusing spot and fine marking effect. The metal absorb UV higher than infrared and therefore more suitable for UV marker marking on metal and glass materials compared with infrared pump machine. Narrower pulse width of UV laser makes a shorter time of processing on materials, thus the materials avoid being deformed or burnt due to thermal. With smaller heat affected area and more beautiful marking effect, our products uv laser marking machine can meet customer’s demand of higher marking requirements. The uv laser marking machine is equipped with safety shield, can effectively isolate the purple radiation, to ensure the safety of UV marker operators. 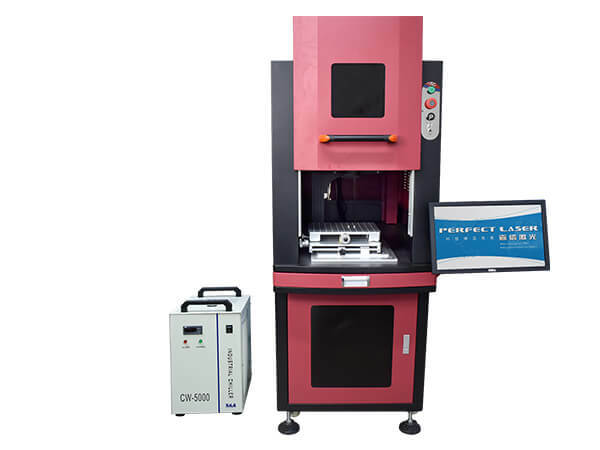 At the same time uv laser marking machine equipped with a professional water cooling machine, air-cooled water circulation cooling, with water-cooled high efficiency and air-cooled small size. (1) UV laser is widely used in electronic components, battery chargers, electric wire, computer accessories, mobile phone accessories (mobile phone screen, LCD screen) and communication products. (2) UV laser is widely used in automobile and motorcycle spare parts, auto glass, instrument appliance, optical device, aerospace, military industry products, hardware machinery, tools, measuring tools, cutting tools, sanitary ware. (3) UV laser is widely used in pharmaceutical, food, beverage and cosmetics industry. (4) UV laser is widely used in glass, crystal products, arts and crafts of surface and internal thin film etching, ceramic cutting or engraving, clocks and watches and glasses. 1. The exquisite seal design of the uv laser marking machine can avoid any dust, at the same time, it can effectively reduce the harm of laser radiation to the human body. 2. Higher pulse stability, the uv marker is more suitable for precision marking, achieving perfect marking results. 4. Humanized operation, intelligent integrated software design and emergency stop function can reduce less damage due to unexpected problems such as wrong operation. 5. The uv marker is support 24-hour continuous operation to meet the large-scale industrial or offline production needs of industrialization.